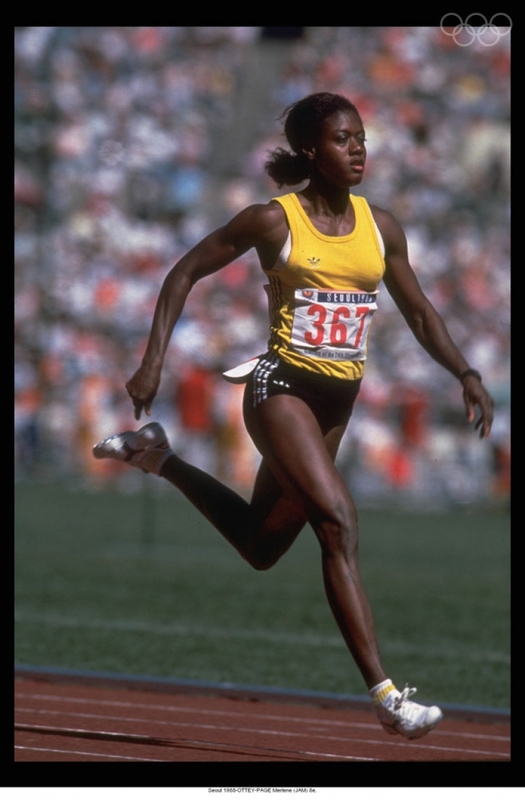 Merlene Joyce Ottey is a Jamaican-born Slovenian track athlete. Ottey began her career representing Jamaica but since 2002 has represented Slovenia, where she now resides. She is ranked fourth on the all-time list over 60 metres (indoor), sixth on the all-time list over 100 metres and third on the all-time list over 200 metres. Her world indoor record for 200 metres, set in 1993, still stands (as of 2013). 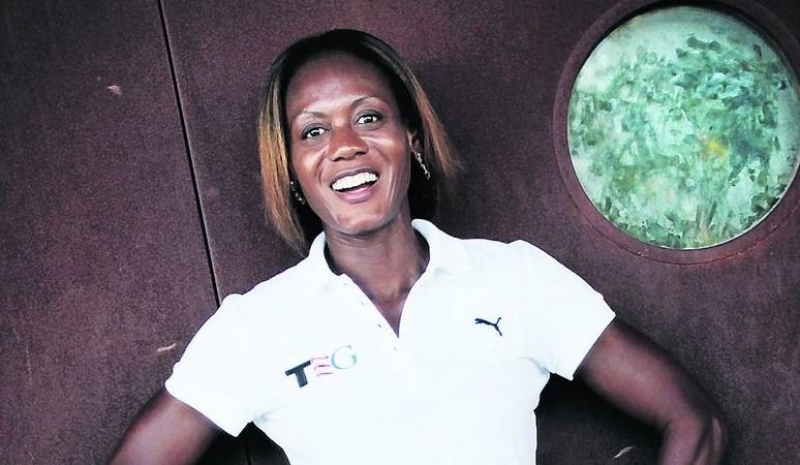 Ottey has had the longest career as a top level international sprinter, which apparently has not yet concluded as she anchored the Slovenian 4x100 relay at the 2012 European Athletics Championships at the age of 52. She holds the record for the most Olympic appearances (seven) of any track and field athlete and for winning the largest number of World Championships medals (fourteen). Her career achievements and longevity have led to her being called the "Queen of the Track". Her proclivity for earning bronze medals in major championships also earned her the title of "Bronze Queen" in track circles. Ottey was formerly married to the American high jumper and 400 m hurdler Nat Page and was known as Merlene Ottey-Page during the mid eighties. Merlene Ottey was born to Hubert and Joan Ottey in Cold Spring, Hanover, Jamaica. She was introduced to the sport by her mother, who bought her a manual on track and field. In her early school years in the 1970s, Ottey attended Gurneys Mount and Pondside Schools before graduating from Ruseas and Vere Technical high schools. There she frequently competed barefoot in local races. Ottey's inspiration came from listening to the track and field broadcast from the 1976 Summer Olympics in Montreal, where Donald Quarrie ran in the sprint finals. Her athletics career took off when she moved to the U.S. and attended the University of Nebraska in 1979, where she joined the track team. 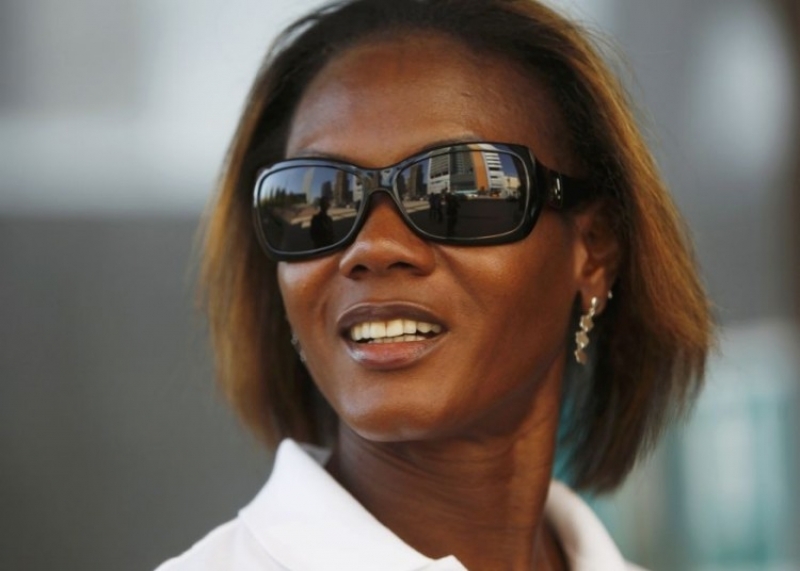 She represented Jamaica in the 1979 Pan American Games, winning a bronze medal in the 200 m. She graduated from university with a Bachelor of Arts Degree and married fellow athlete Nathaniel Page in 1984 and briefly used the name Merlene Ottey-Page. The couple later divorced. Throughout her career, she has won nine Olympic medals, the most by any woman in track and field history [dead link]. These include three silver and six bronze medals. She has never won an Olympic gold medal, but lost by five thousandths of a second to Gail Devers in the 100 m Final at the 1996 Summer Olympics in Atlanta when they both recorded the same time of 10.94 seconds. This was not her closest finish to Devers – she recorded a time of 10.812 seconds to Devers' 10.811 seconds in the 1993 World Championships in Stuttgart – still the closest finish at an international athletics meet. She won 14 World Championship medals between 1983 to 1997 —more than any other athlete, male or female — however, her failure to win many golds in major international competitions earned her the nickname "the Bronze Queen" in racing circles. She has won a total of three gold, three silver and eight bronze medals in the 4 x 100 m relay, the 100-m, and 200-m races. Ottey was appointed an Ambassador at Large by the Jamaican government in 1993. In 1999, during a meet in Lucerne, Switzerland, a urine sample submitted had returned positive for the banned anabolic steroid nandrolone. Her 'B' sample also contained higher than normal levels of the substance. Ottey was subsequently banned by the IAAF from competing in the World Championships in Seville, Spain. 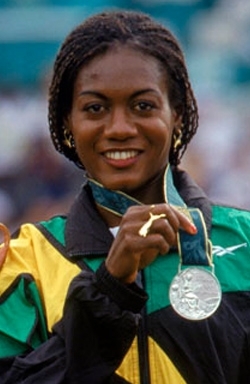 Ottey fought to clear her name, asserting that charge was a "terrible mistake", and that she was innocent of knowingly taking steroids.In the summer of 2000, Ottey was cleared of all charges by the Jamaica Amateur Athletic Association, the IAAF lifted its two year ban, after the CAS dismissed the case; it is important to note the Court of Arbitration for Sport dismissed the case because the retesting was not completed in the alotted time. In Jamaica, at the National Senior Trials prior to selection for the Olympics, Ottey placed a disappointing fourth. According to the rules of the Jamaica Amateur Athletics Association (JAAA), only athletes who had finished in the top three at the trials were eligible to run at the Olympics; she was only qualified to run on the 4 x 100 m relay team. Ottey asked that she be substituted for another team member, a courtesy that had been extended to others in the past. 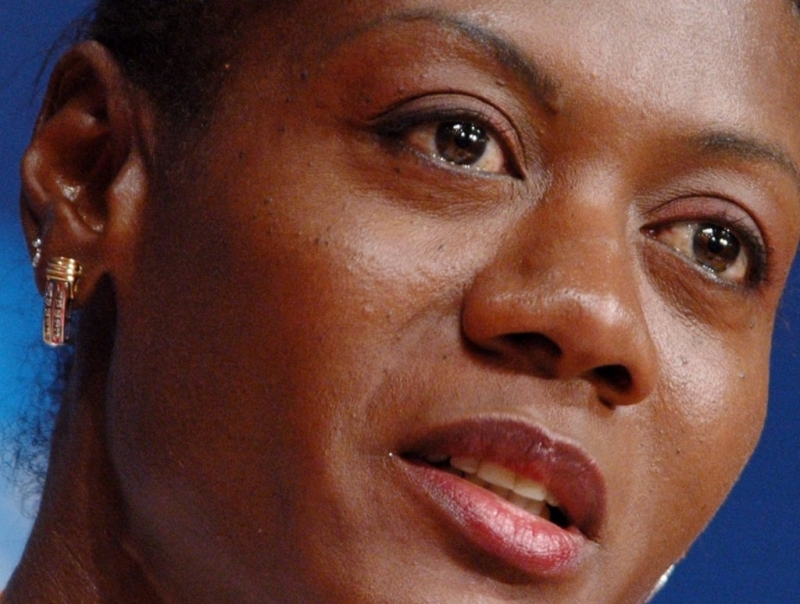 The JAAA's decision to replace Peta-Gaye Dowdie with Ottey caused widespread controversy. Dowdie's team members and many Jamaicans believed that Ottey had bullied her way onto the team. She was construed as an aging icon trying to retain power by usurping the place of a younger and equally worthy athlete. Jamaican 400 m Olympian and championship medallist Gregory Haughton lead the notorious "Games Village" protests to oust Ottey, which made international headlines. The protest ended when The International Olympic Committee (IOC) threatened to throw the Jamaicans out of the Games if the team managers were not able to control their charges. At the 2000 Olympics, Ottey finished fourth in the 100 m, beaten from a medal by fellow Jamaican sprinter Tayna Lawrence. The race was won by Marion Jones who registered 10.75 seconds, followed by Ekaterini Thanou of Greece in 11.12 seconds. Lawrence posted 11.18 seconds to Ottey 11.19 seconds. In the 4×100 relay, the Jamaican team — bronze medalist Lawrence, teenager and newcomer Veronica Campbell, and Beverly McDonald — was anchored by Ottey to a silver medal. This medal gave Ottey her eighth medal, the most ever for a female athlete. 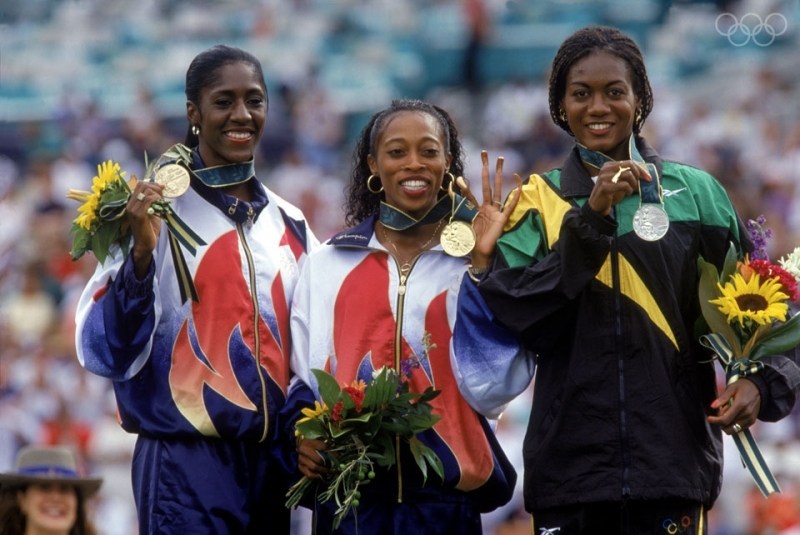 Nine years later, Ottey's fourth place was retroactively promoted to third – giving Ottey her ninth medal – and Lawrence to second when Jones was stripped of her medals for steroid abuse. Due to the controversy, Ottey decided that "after Sydney I said I wasn't going to run another race for Jamaica ... because I felt like the Jamaicans were trying to push me out of the sport and I really needed to prove my point, that I might be 40 but I can still run." In 1998 Ottey moved to Slovenia and began training with Slovene coach Sr?an ?or?evi?. There she was still representing Jamaica. However, in May 2002, she became a Slovenian citizen, and now resides in Ljubljana, where she represents her new country in international events. Ottey competed for Slovenia in the 100 metres at the 2004 Summer Olympics in Athens, where she reached the semifinals. At age 46, she competed in the 2006 European Championships in Athletics. She finished fifth in the semi-finals of the 100 metres and did not qualify for the final, which was won by Belgium's Kim Gevaert. Ottey failed by 0.28 seconds to reach her eighth Olympic Games, aged 48 in 2008. In spite of this, two years later she qualified for the Slovenian 4 x 100 metre relay squad at the 2010 European Athletics Championships where she became the oldest athlete ever to participate in the history of the European championships. 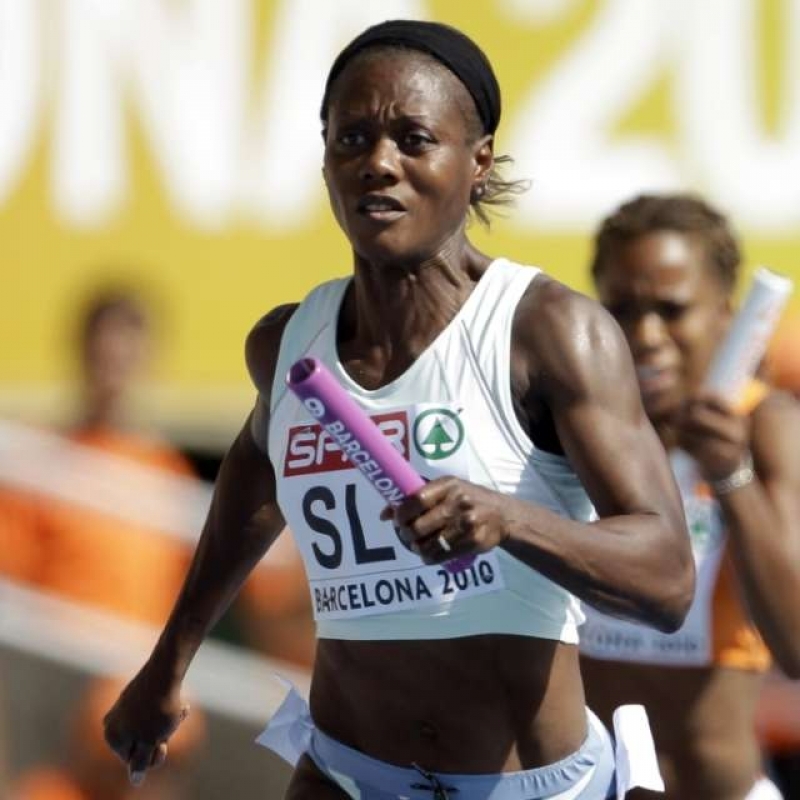 At the age of 52, Ottey competed in the 4x100 meters relay at the 2012 European Athletics Championships.The Slovenian team only ranked #22 in the world before the 2012 Olympics and only the top 16 teams got to run. Ottey ranks at number three on the list of the top ten all time athletes on the 200 metres – women, and number six on the 100 metre list. Ottey is the first female athlete to run 60 metres under seven seconds — and 200 metres under 22 seconds [ indoors]. She has also clocked the fastest 100 and 200 metres in the same day. Ottey has run 100 metres under eleven seconds — 67 times ( plus 9 wind-assisted ) a record among female sprinters. Ottey has 57 consecutive wins in 100 metres — the most consecutive wins over 100 metres for a female, and 34 consecutive wins at 200 metres. Ottey holds the official World Masters Athletics world records in the 100 m and 200 m for the age groups W35 ( 100- 10.74 in 1996, 200- 21.93 in 1995 ) W40 ( 100- 10.99 in 2000, 200- 22.74 in 2004 ) W45 ( 100- 11.34 in 2006, 200- 23.82 in 2006 ) W50 ( 100- 11.67 in 2010, 200 24.33 in 2010 ). Ottey is the first from the Western Hemisphere (outside the USA) to win two individual medals at the same games. At the 1995 World Championships, Ottey became the oldest ever female gold medallist when she won the 200 m at age 35 years 92 days. At the 1997 World Championships in Athens, she became the oldest female medallist ever at 37 years 90 days, when she won the bronze medal. 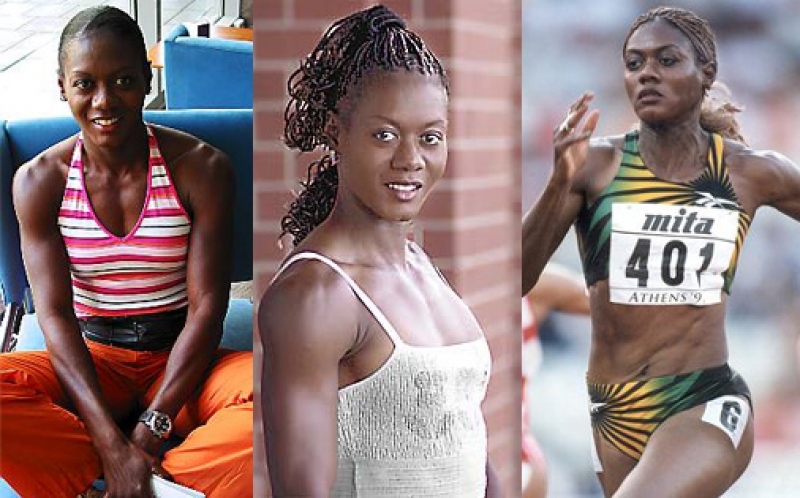 In the 2000 Olympics, at age 40, Ottey became the oldest female track and field medalist when she anchored the Jamaican women's 4×100 metres to a silver medal. With the disqualification of Marion Jones, she was awarded the bronze medal in the 100 metres, making her the oldest individual medallist. Ottey is also one of only two athletes to win twenty medals at the Olympic Games and the World Championships (combined). Ottey holds the record for running the fastest women's Indoor 200 metres, in 21.87 seconds. This record has stood since 1993 and remains (as of 2013) the only sub 22sec clocking by a woman indoors. In six World Championships competing for Jamaica, Ottey has won fourteen medals: three gold, four silver and seven bronze medals, while at the Olympics she has earned three silver and six bronze medals. Ottey was the first female Caribbean athlete to win an Olympic medal. Ottey has won more Olympic medals than any other female athlete in the Western Hemisphere.